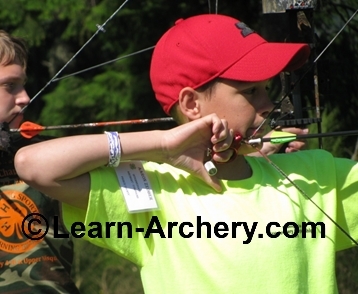 Determine Beginner Arrow Length For Success! Selecting a proper beginner arrow length is simple if you follow our easy instructions presented below. 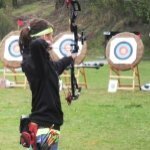 Purchasing archery equipment for the first time can be overwhelming and sometimes confusing but once you understand the basics of arrow length you can move along. Believe it or not, proper arrow length for anyone beginning in archery is one of the most important pieces of safety equipment. If you don't have the correct arrow length you are putting yourself and others in personal danger. Secondly, if you don't have the correct arrow size (spine) you will increase the risk of an accident tenfold. Wait - What is the difference between arrow length and arrow size? Yes, it is confusing...but that's why we are here - To help you unravel all the tech-talk, lingo and jargon that has frustrated every beginning archer for more than half a century. Before we get in to the method for finding your proper beginner arrow length, lets clear the air as it relates to arrow length and arrow size. Arrow Length - refers to the length of the arrow shaft. Arrow size - refers to the spine (stiffness) of the arrow. The shaft size is always referring to the diameter of the shaft, the wall thickness of the shaft and the distance that the arrow shaft will flex before it bends or breaks. Now that you know the difference between arrow length and arrow size (spine) lets get back to the purpose of this page. 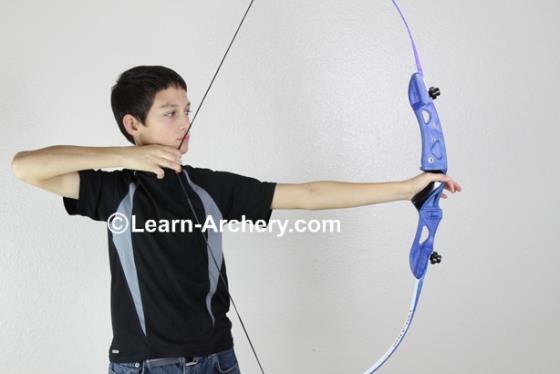 This section describes how to select the proper arrow length for a beginner archer. 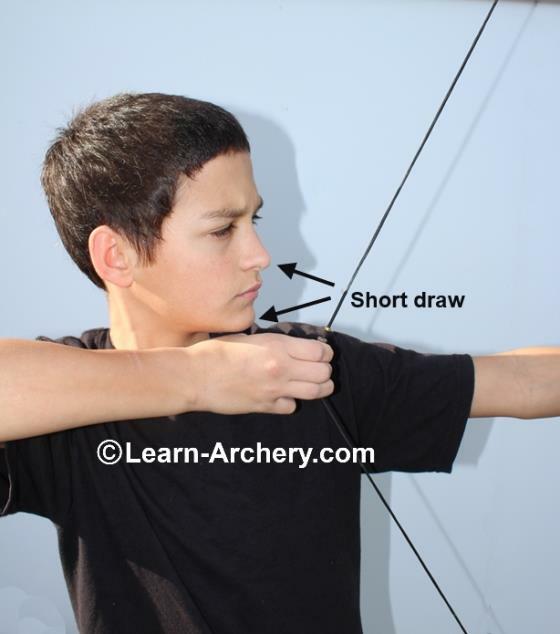 Before you determine your beginner arrow length it is equally important to understand some basic shooting form errors that will give you a false reading for archery arrow length. I will explain the difference between incorrect and correct posture and form at the end of this section to help assure you get the correct information the first time. One important factor you need to embrace right now is that not all arrows are alike and your arrow length is specific to your needs only. Shooting someone else's arrow or any arrow that was not properly sized to your specific needs is a bad idea...particularly if the arrow is too short. Drawing an arrow that is too short will result in the arrow falling off the arrow rest and possibly being shot into the back of your hand. Shooting arrows that are too short is dangerous not only to the person drawing the bow and arrow but to everyone who is in close proximity to the archer. Not a lot of words need to be said here - simply look over the following images and read the captions to understand why an arrow should be the proper length. 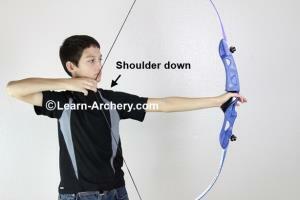 In the photo below the point of the arrow is going to fall off of the arrow rest if the archer "over-draws" the bow. What happens next can result in very serious and painful injury. [C] and potentially shoot through the back of your hand! Not good!!! If you don't believe it happens...and you have the stomach for it, simply google the phrase "archery arrow hand". If you're new to archery or you have not had formal instruction you should have arrows that are at least 1.5" - 2" beyond the back of the bow until you have learned proper shooting form. Drawing the bow and arrow with proper archery form and anchoring in the correct location is the only way to reduce the risk of overdrawing the arrow. How do I avoid this potential hazard and protect myself from injury? Beginners should always start with arrows that are long until they learn the proper drawing technique and proper anchor position. 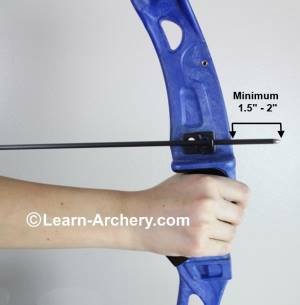 What is the proper way to size archery arrows for a beginner? Arrows should be at least 1.5" - 2" beyond the back of the riser at full draw. Where do I start with beginner arrow length? 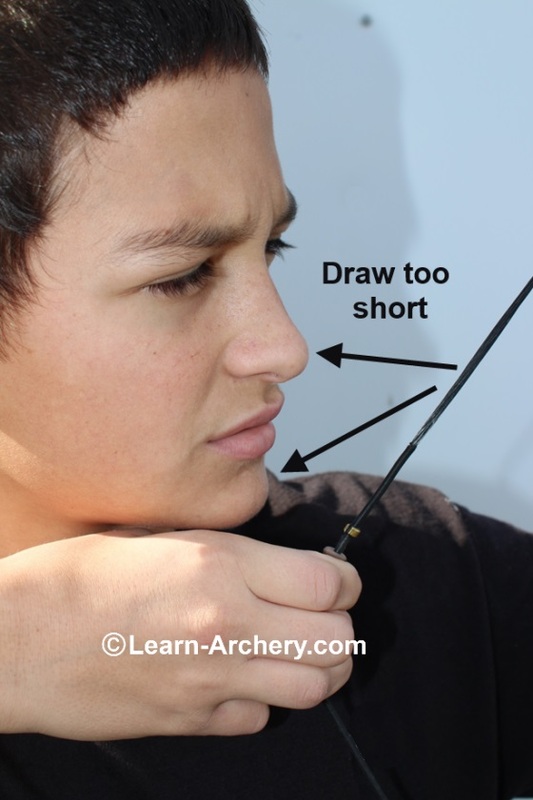 To start the process for determining your beginner arrow length, follow any of the simple procedures outlined below and you will know what size beginner arrow length you need in a jiffy. Note: There are other more precise methods to determining proper arrow length but they are for experienced and advanced archers. 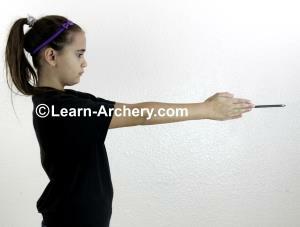 Before you can determine your proper beginner arrow length, you will need an assistant to mark the arrow for you. Assume a posture and stance as though you are going to actually draw a bow. Stand with your feet about shoulder width apart and perpendicular to your imaginary target as in the photo below. Assume the position as though you are at full draw and anchor with your head turned toward your imaginary target as in the picture below. 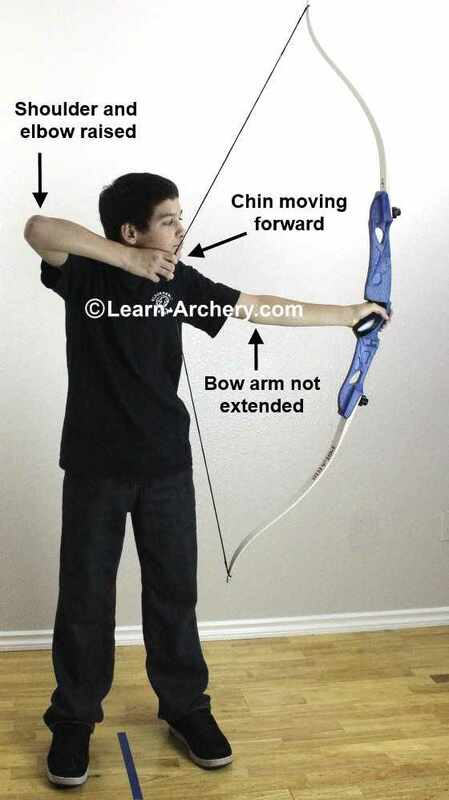 The chin should be up and the bow arm fully extended toward the imaginary target. The elbow of the drawing arm should remain directly behind the arrow line. What is the easiest and safest way to determine the proper arrow length? The first method assumes you have access to equipment or you plan to visit a pro-shop for help. The best method of determining correct archery arrow length requires a bow with a light draw weight and an extra long arrow. You will also need an assistant with a marker to help you. NOTICE: All of the methods discussed on this page for determining proper arrow length are for arrows that will use target or field points. DO NOT use any of the information on this page for arrows that will use broadhead or any other hunting tip or device. Start with an arrow that is known to be extra long (3 to 4 inches longer than your reach. Check the arrow first by placing the knock on your breastbone and between your outstretched arms and palms. Make certain there is at least 2 to 3 inches of arrow shaft extending past the finger tips. 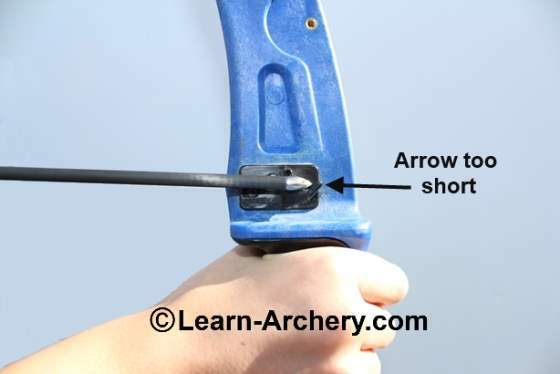 The purpose of using an extra long arrow is to be certain there is no risk of the arrow falling off the arrow rest if the bow is overdrawn. Draw the arrow and anchor under the chin or with the index finger in the crook of the mouth. Alternatively you can use an anchor position where the index finger is placed under and against the jaw bone as shown in the image below. 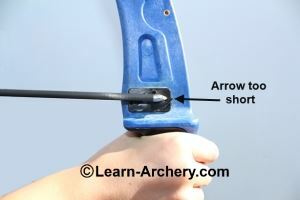 While you are at full draw and "HOLDING" have your assistant mark the arrow shaft where it meets the back of the riser [A]. NOTE: It is highly recommended that you use a bow with a low draw weight so you can safely draw, anchor and hold the arrow without becoming fatigued. ATTENTION: Make sure your assistant is standing behind the arrow flight path!!! Archers who have little experience but shoot with relatively good form should mark the arrow even with the back of the bow riser. Beginners with no experience are advised to make the arrow at least 2" beyond the back of the bow riser for added safety [B]. Carefully let down the arrow when your assistant is safely behind you. 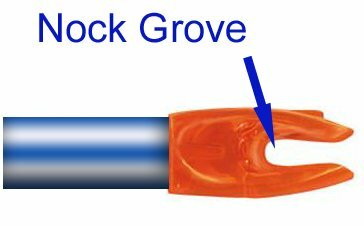 Remove the arrow and measure the distance from the nock grove hole to the mark you just made. Experienced archers can mark the arrow even with the back of the riser [A]. 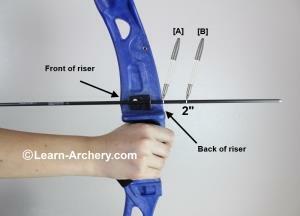 New archers should add at least 1-1/2" to 2" to the length [B]. Entry level archers who have had formal instruction and shoot with good form and posture can use the distance from the nock grove to first mark [position A]. Beginners with no formal instruction and no experience will add 2" (50.8mm) [position B]. Note that the point of the arrow or tip is not included in the arrow length. 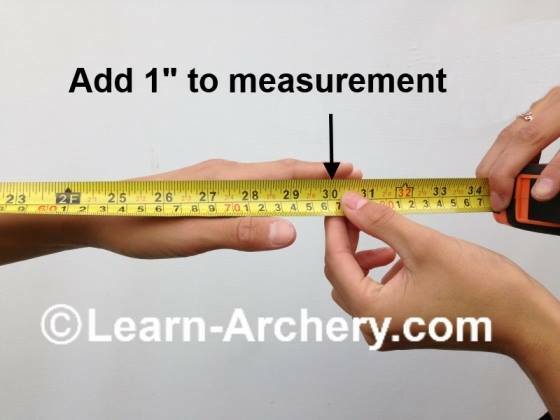 This measurement that you obtain is your new proper beginner arrow length (arrow shaft only). 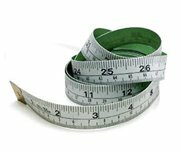 What do I do when I do not have equipment to measure with? This technique for determining your beginner arrow length only requires a tape measure and an assistant. 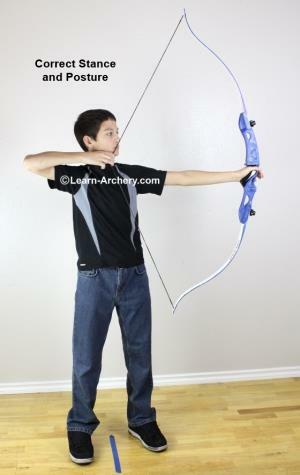 Start with the proper stance and anchor position with the bow arm extended out to your side. While holding the end of the tape measure (pinched between index and middle finger) have the assistant stretch the tape out to the end of your thumb. Note that the drawing arm elbow is directly behind the arrow line and the forearm is almost parallel to the shoulder line. The anchor position is found by placing the top of the index finger near the crook of the mouth. Alternatively the drawing hand can be placed under the jawbone and close to even with the crook of the mouth. Point the thumb of the bow hand toward the imaginary target without turning the wrist. With your thumb stretched outward (toward the imaginary target) make a note of the distance to the end of the thumb. From the end of the thumb add one inch (1") (25.4mm) to the measurement. 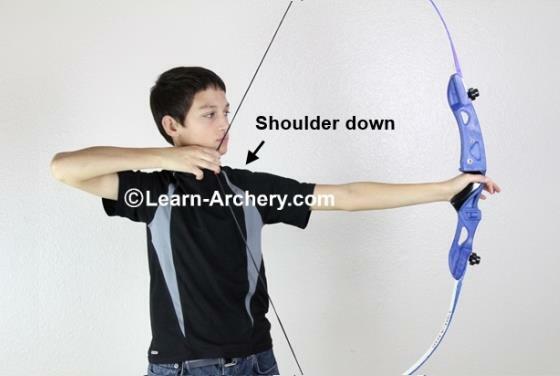 NOTE: A compound archer will have a different anchor position depending on the type of release mechanism they use but the method for finding their beginner arrow length is the same. Again, note that the arrow point is not included in the measurement. The distance you come up with is for the "arrow shaft length" and NOT the total arrow length. 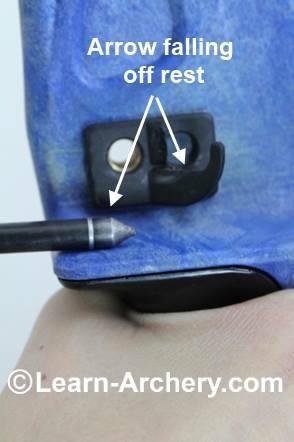 In the end, your arrow should extend past the thumb a minimum of 1 inch (25.4mm) for safety. If the arrow is too short it is possible to draw the arrow back off the arrow rest creating a very dangerous situation as illustrated above. 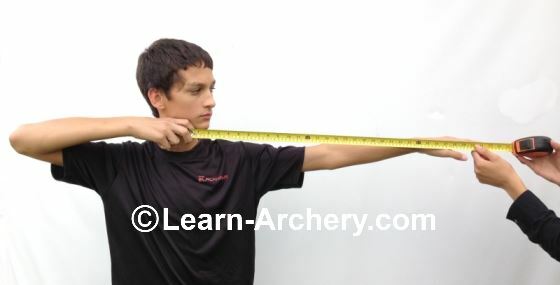 That's really all you need to know to determine proper archery arrow length for beginners. 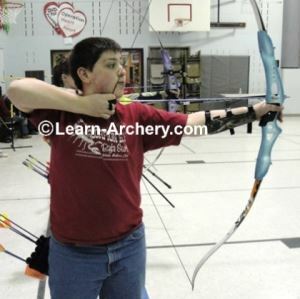 Both methods work and the important piece to remember is that a beginning archer should always start with an arrow length that is longer than the actual draw length for safety reasons. Until your shooting technique is developed including proper shoulder and bow arm elbow alignment and you are certain that you will not overdraw the bow, stick with an arrow length that is long. How can I be certain that I measured my beginner arrow length properly? Below are some common shooting form errors that will give you a false reading when trying to determine your proper beginner arrow length. The images below show the incorrect technique AND the correct shooting form you should be using when determining proper arrow length for a beginner. In this photo the archer has incorrect posture. 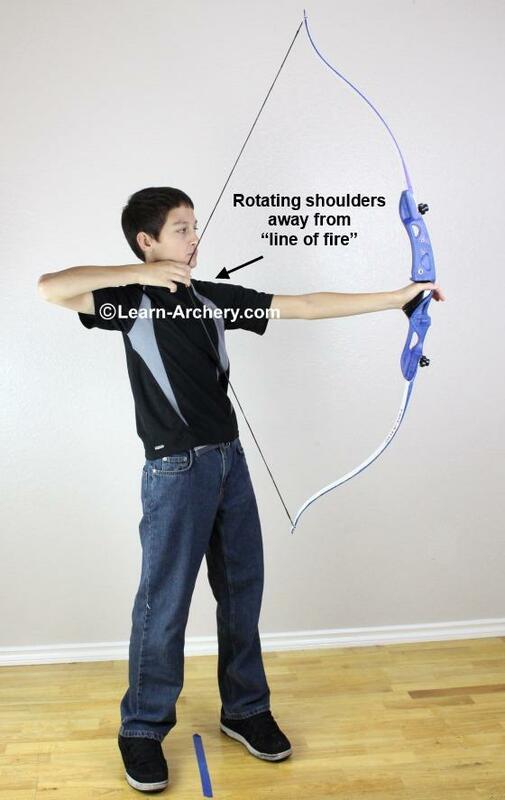 Rotating the shoulders away from "the line of fire" will shorten the draw length. Use correct stance and posture - make sure the hips and shoulders are in-line with the direction of aim as shown in the following image. 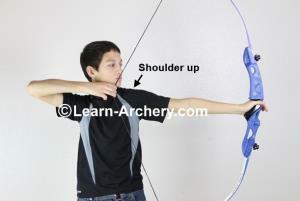 In the following image note that the "bow-arm shoulder" Is raised up toward the ear. This is poor bow-arm shoulder positioning. The result is a shortened draw length. 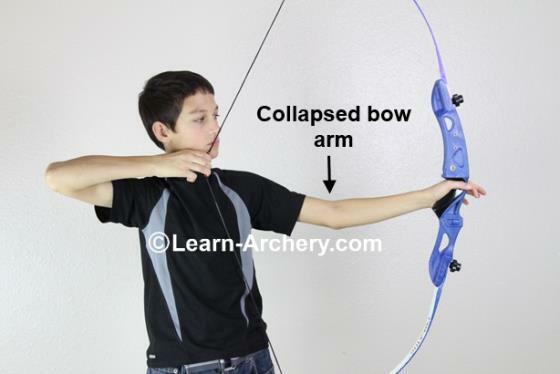 Notice in the following image that the bow arm shoulder is set down in the correct position. In the following image the archer is creeping forward with the chin resulting in a shortened draw length. Note that the shoulders are raised, the bow arm is not extended out to the side toward the target and the elbow of the drawing arm is raised above the shoulders. The chin should remain up and the neck elongated directly over the torso as in the correct stance and posture photo above. 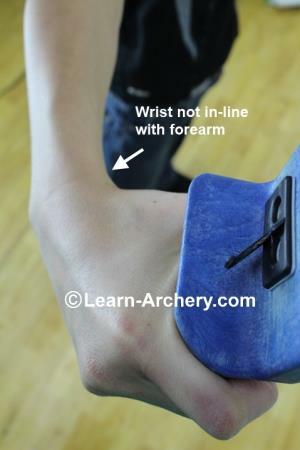 Some archers will turn the wrist so it is out of alignment with the forearm and upper arm resulting in a shortened draw length. 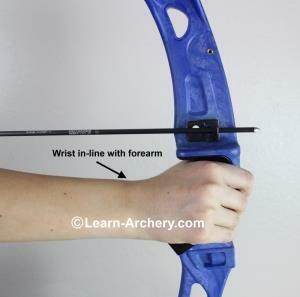 The wrist should remain "in-line" with the forearm and upper arm as in the photo below. A collapsed bow-arm will result in a shortened draw length. Keep the bow arm fully extended toward the point of aim as in the picture below. 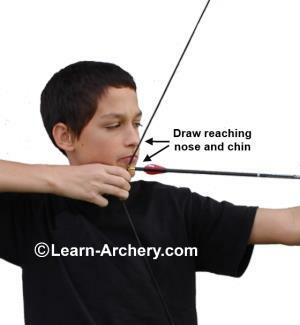 Short draw is when the archer fails to reach full draw where the bowstring touching the chin or the nose. Avoid short draw by pulling the string all the way back until it contacts your chin amd nose. Over drawing is when the archer continues to pull the bowstring beyond the "full draw" position. 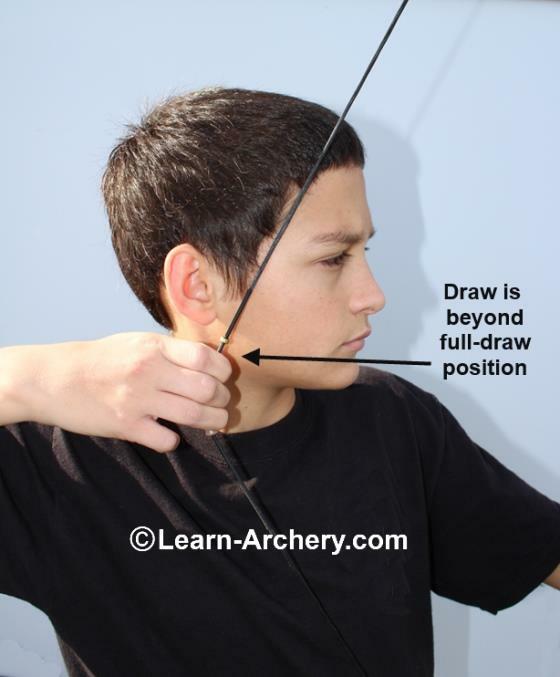 Over drawing will result in pulling the arrow to far back behind the chin causing the arrow to fall off the arrow rest. 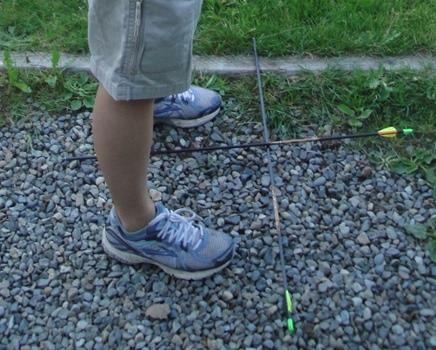 Avoiding all of these common archery form errors will help assure that you get the proper beginner arrow length. Now that you know how long your arrow shaft should be you can have the arrows cut to length by most archery or outdoor pro-shop, box store or mail order company. 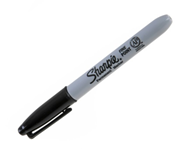 Most mail order companies, pro-shops and box stores will cut them to your specifications and glue the points in for you. Now you know how to find your proper beginner arrow length. The next step is to determine the proper arrow spine (size) that matches your equipment specifications. NOTE: The page named "Draw Weight" listed under the Getting Started tab is dedicated to making draw weight recommendations for beginners. It is not the same as determining your actual OR calculated draw weight. 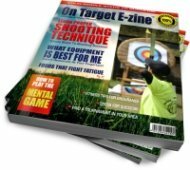 Have A Question About Determining Your Beginner Arrow Length? Great information just what I was looking for. Your site helped remove a lot of the mystery.